Thursday, 25th of April 2019, starting at 6 p.m. The exhibition can be visited at our location in Feldkirch until April 2020. We invite you to the vernissage of the exhibition of Rouven Dürr. The event will begin on Thursday, 25th of April 2019, at 6 p.m. at for​you​and​your​cu​sto​mers in Feldkirch. 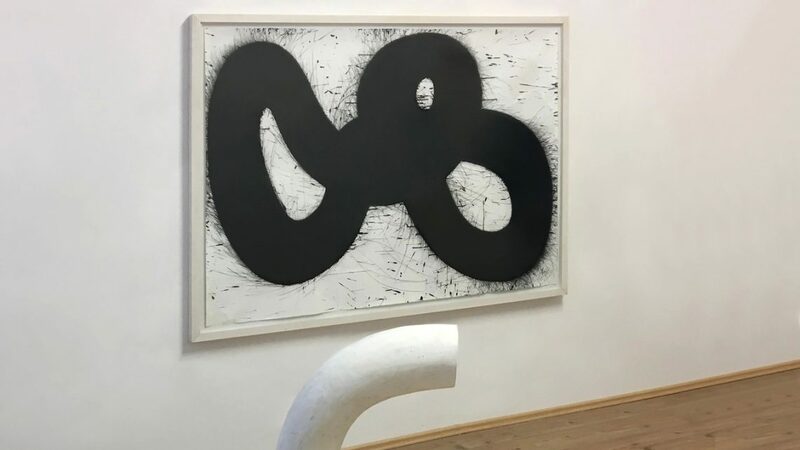 An introduction will be given by gallery owner Georg Peithner-Lichtenfels at 7 p.m.
For many years I have accompanied Rouven Dürr and observed his work with joy. While his reduced sculptures were long characterized by corners and edges, they gradually developed into softer forms. He creates ribbons that intertwine into knots or open up into space. It seems as if Rouven Dürr’s sculptures are no longer subject to gravity, but rather find their balance in their lightness on the pedestal or on the wall. White and black concrete forms that enclose the space without contrasting or competing with it. A congenial partnership of space and sculpture. In his drawings – in ink or watercolor – Dürr does not remove the pen or brush until the painting is finished. This can be seen particularly beautifully in his large-format drawings, which seem to have been cast in one piece. Here, too, Dürr follows his path of knots and dissolvings, which always brings with it new twists and turns. The exhibition has been curated by Georg Peithner-Lichtenfels. It can be visited until April 2020 by prior appointment via telephone (+43 5522 982 73) at our location in Feldkirch.